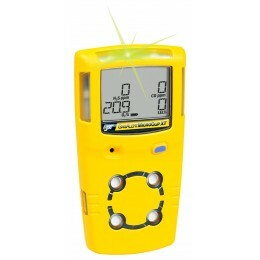 The Gas Alert MicroClip XT is the only gas detector of its size that is so simple to use and so affordable. With tamper-proof operation, the slim and compact GasAlert MicroClip XT multi-gas detector offers one-button simplicity and significantly reduces time spent training the user. The monitor is designed to be thin, rugged, durable and lightweight, and also has a built-in concussion proof boot. With backlight and simple auto zero and auto calibration and diagnostics protection, it also offers up to 16 hours battery time.